853412 Anakin Skywalker Key Chain is a Star Wars Key Chain, featuring Anakin Skywalker as he appears in the Episode I: The Phantom Menace subtheme. It was released in March 2012. This is a description taken from LEGO.com. Please do not modify it. Fly through traffic with Anakin Skywalker in Podracing gear! Be the king or queen of the road with the iconic Star Wars™ Podracing hero! With a sturdy metal ring and chain, this authentic Anakin Skywalker minifigure makes the perfect passenger in any vehicle. Makes a great gift for LEGO® Star Wars fans! Use as a key chain or backpack charm! Makes a great gift for fans of LEGO Star Wars™: building sets! 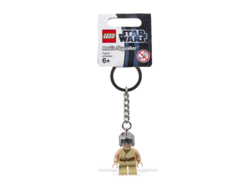 Facts about "853412 Anakin Skywalker Key Chain"
Fly through traffic with Anakin Skywalker in Podracing gear! This page was last edited on 20 April 2019, at 00:15.